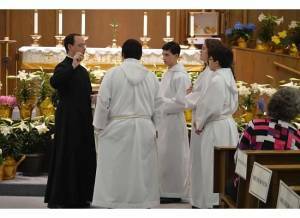 Altar Servers have an integral role in assisting the priest in the normal celebration of the Mass. It is a tremendous responsibility and honor to serve on the Lord’s Altar at the Sacrifice of the Mass. 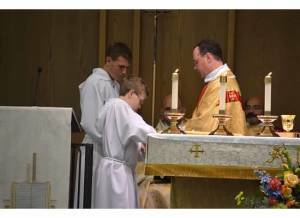 Any child in the parish who is at least in the third grade may be trained to become an Altar Server. If your child is interested in serving the Lord at Mass as an Altar Server please contact the parish at 724-846-7540 or office@saintmonica.us.